View More In Closet Systems - Page 5. Try to use our Misslo zippered Clothes storage bag. 600D Oxford fabric, Durable, resist the wears and the tears.Keeps your stuff neat and tidy and dust-free. Large capacity + well-constructed clear window + good zipper + strong handle supports. 1. Right size (19 4/5" L 15 9/10 W 9 2/5" H )for hold a set of queen size flannel sheets, even if you are a sloppy folder, plus an extra set of pillowcases with no difficulty. 3.Double Zippers Storage Bag, Protect your stuff free of dust, bugs and anything else. 4.Strong handles on each side of the organizer for easyhandlingor to take along when traveling. Fits for clothes, sweaters, bath towels, quilts, summer comforters, vintage linens and crocheted items etc. Great for garment and bedding storage. Perfect at dorm, college for garment, closet, bedding or under bed storage. 3 Sets of fabric storage bag, Perfect for storing seasonal clothing, blankets, linen, bath towels, summer comforters, pillow and bed sheets etc. Medium size clothes storage (19 4/5" L * 15 9/10 W* 9 2/5" H), not too big to make it heavy and can holds 2-3 blankets or 20 winter sweaters each. Clothes Organizer with 2 Strong metal zippers closure, Airtight and Keeps your stuff dust-free, mold-free. Wide Clear see through window in the front for quick viewing what are stored inside the container. 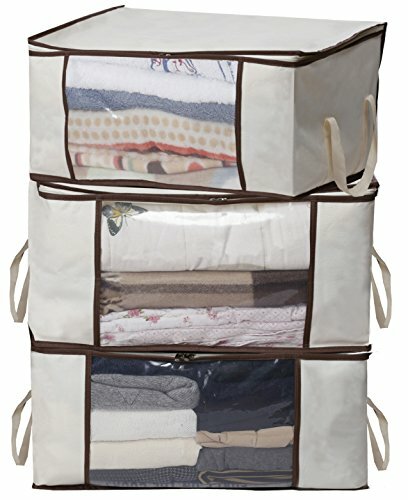 Foldable storage organizer bags, better than storage box /bins and not take any space. Great for store in closets shelf, underbed in bedroom, drawers, basement and even for travel or moving. Works well as a closet storage dorm organizer. If you have any questions about this product by MISSLO, contact us by completing and submitting the form below. If you are looking for a specif part number, please include it with your message. Hudman Works Strap & Hook XL, Bright Orange, 50"